Round Concrete Planter 36" Dia. x 24"H Concrete, Portable, 750 lbs. A variety of plants, trees or flowers can be added to this 36"dia. x 24"H round concrete planter to enhance your landscape & provide security. Plants, flowers, and trees bring natural respite to visitors & employees, while adding to the richness of your landscape. Made of precast concrete reinforced with steel rebar. Our garden planters accept our exclusive reservoir system. Available in a variety of colors & finishes. ADA Compliant Modified Square Concrete Picnic Table with Bolted Concrete Frame, 3 Attached Benches. 950 lbs. Concrete Trash Receptacle 45 Gal. Concrete with Push Door Top, Portable. 870 lbs. 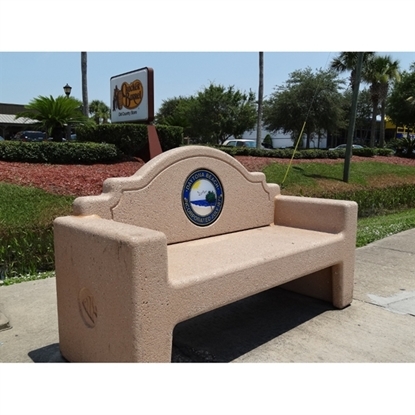 Concrete Custom Memorial or Logo Park Bench, 84", Easily Customized. 1,500 lbs.